Norber surprised me by demonstrating how he could change the sound of the rolloff and midrange character of PranaFidelity's Vayu/fs two-way quasi-line-array loudspeaker ($8950/pair) by changing the materials of his resistor groups. Whatever he did, the warm core of this system's sound continued to win me over. 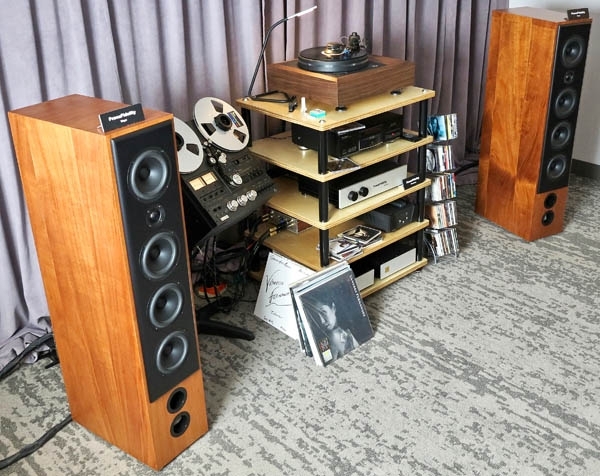 Heard or seenhey, I was trying to pack in as many rooms as possible on the last day, and my note taking slipped a bitPranaFidelity purna/ca preamp ($8500 or $9950 for balanced, both with phono), MG Audio Design prototype monoblocks (possibly $5000/pair), Kuzma Stabi R turntable with 4Point 9" tonearm and CAR 50 cartridge, Wyred 4 Sound DAC-2 modified by PranaFidelity, and Kubala-Sosna Realization cabling and XPander.